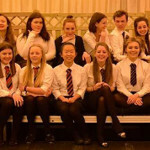 The Senior Choir triumphed in their category at the Harrogate Competitive Festival for the second year in a row. The Junior Choir were hot on their heels. 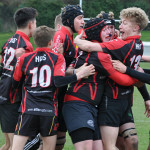 Yorkshire Schools Champions for Rugby U16s ! The U16 rugby team are crowned Yorkshire School’s Champions after defeating Crossley Heath, Halifax, 20-22 at QEGS. Find out more about the bespoke direct bus routes available to our students including Leeds, Wetherby, Pateley Bridge, Boroughbridge and Ripon. 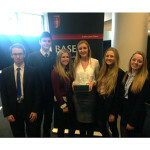 Success for Sixth Form students as they reach the national finals of the BASE National Business competition after beating 7 other schools in the regional finals. 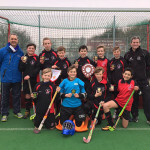 U13 boys hockey team reach national finals! Success for U13 boys hockey team as they reach the national 7-a-side finals after beating 17 schools and gaining the Harrogate and Craven, North Yorkshire, North East of England and finally the North of England titles. 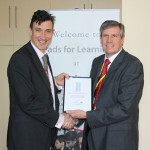 eLearning Foundation awards HGS as regional champions for their outstanding use of technology as a truly integrated part of their student’s learning. 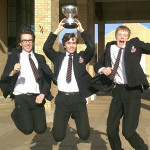 Elliot Wright, Jack Hennighan and Will Giddings ) storm to their second victory in the regional finals of the ESU Churchill Public Speaking competition. 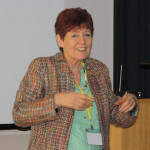 Students from Ripon Grammar, Malton, Harrogate Grammar and King James’s School came together for a psychology conference where Professor Vicki Bruce from Newcastle University gave a talk on face perception. 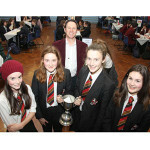 Success at the annual Battle of the Books contest, year 8 and 9 students fought against other schools in the area to win the sought after trophy! 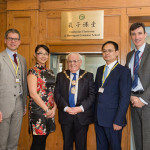 To celebrate being awarded Confucius classroom, the first in Yorkshire, a plaque was unveiled by the Mayor of Harrogate and students took part in Chinese New Year activities.